I’ve always been a huge fan of anything space or alien-related (I blame growing up with The X Files) and, with help from Alien’s Love Underpants, Caterpillar is becoming a big fan of all things extraterrestrial too. So this adorable tale from Michelle Path was a perfect fit! Xalien the Purple Alien is a classic adventure story really. Siblings Sarah, Jessica and Adam investigate a rustling in the bushes to discover a strange, purple creature who has crash landed on earth. They proceed to introduce her to life on their planet but it’s not always plain sailing for Xalien to adjust to our ways which makes for some funny moments. Among the ET-style fun I feel there is a great message about highlighting and accepting the differences between us, which is a good lesson for kids and really relatable for any child who has ever felt they do things a little differently from others. The illustrations are really bold and colourful and I especially love how the dark purple colour of Xalien really pops on each page. It’s fairly long for a picture book so we read it over two bedtimes but Caterpillar is still very young so for a slightly older pre-schooler is would probably be a good length. An interesting and fun read for inquisitive children (and UFO-loving adults!). Michelle has written nine other children’s books, including three more featuring Xalien’s adventures. 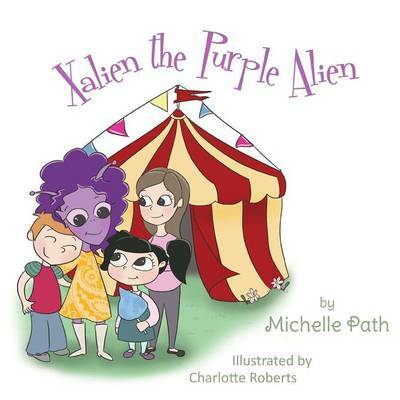 Click here to find out more about Michelle and get your own copy of Xalien The Purple Alien.